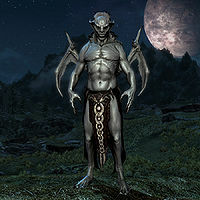 "Vampire Lord" is a lesser power added by the Dawnguard add-on that allows players with vampirism to turn into a powerful Vampire Lord: a large humanoid creature with sharp claws and bat-like wings. In order to gain this ability, you must accept Lord Harkon's gift during the Bloodline quest or receive it from Serana after Chasing Echoes. She also offers the option to infect you after completing Destroying the Dawnguard or Kindred Judgment. The ability can be used an unlimited number of times per day and at any point during normal gameplay. While not in Vampire Lord form, you will still have all the characteristics of a normal vampire. As a Vampire Lord, you will be able to use blood magic and other dark powers, and can either levitate and use spells or remain on the ground and fight with deadly claws. In Skyrim, only the more pure-blooded vampires such as those of Lord Harkon's court have this ability and, according to him, the family's vampirism was a gift directly from Molag Bal himself. Accepting Harkon's gift will permanently align you with the Volkihar; the only way to become a Vampire Lord and side with the Dawnguard is to wait for the option to be infected by Serana. You will retain the "Vampire's Sight" ability from your ordinary vampirism, but all other effects are either removed for the duration of your Vampire Lord form or replaced with a Vampire Lord version of the same effect. Your health, magicka, and stamina increase by 100 points each. You gain the same unarmed damage as Khajiit and Argonians, and the same claws trait as a Khajiit, only at magnitude 20, not 12. This means non-Beastmen gain 6 unarmed damage, then non-Khajiit gain 20 unarmed damage and Khajiit gain 8 (final unarmed damage is 30 for all Vampire Lords, regardless of starting race). When outside during the day, your health, magicka, and stamina decrease by 60 points each. When outside during the day, health, magicka, and stamina regeneration is reduced by 90%. Ability to use the Vampire Lord version of Vampiric Drain, which has a Damage Health effect in addition to draining health, magicka, and stamina from your target (see details below). "Vampire Claws" constant effect, which gives you additional health, magicka, and stamina, increased unarmed damage, damage resistance, and waterwalking (see table). 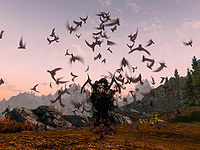 "Bats" special ability, which allows you to transform into a swarm of bats for two seconds in order to evade damage (costs 25 magicka). The Raise Dead spell (similar to the "Vampire's Servant" spell granted with ordinary vampirism), which allows you to reanimate a fallen corpse to fight for you (see table). While you are in Vampire Lord form, only the Amulet of Bats, Amulet of The Gargoyle, Ring of The Beast, or Ring of the Erudite can be used; all of your other equipment is removed automatically. You also will not be able to use your normal spells, dragon shouts, or powers, but your attacks increase in power and speed. You will move more quickly as well, but since the "Vampire Claws" constant effect gives you the waterwalking ability, you cannot swim as a Vampire Lord. Once you transform, all summoned creatures (including dead thralls) will immediately die. Your racial abilities do not carry over into Vampire Lord form, but existing spell effects do. This includes passive abilities such as The Lord Stone, the Blessing of Mara, and the Magic Resistance perks from the Alteration skill tree. It also includes the Destruction Cloak spells and the Alteration Flesh spells. Vampire Lords are dangerous, fearsome creatures, and you will be attacked on sight if you are seen in this form. However, since NPCs will not recognize you, crimes committed in Vampire Lord form will not be attributed to you and will not increase your bounty. If you are seen transforming, 1000 gold will be added to your bounty. The world was not built for Vampire Lords, so you may get stuck in some small doorways while in this form. To avoid this, try turning sideways so that your wings go through the doorway first. In most cases, you can get through. When all else fails, the Bats ability will get you out of tight jams fairly well. While in Vampire Lord form, you can choose to either levitate or walk normally; you can only cast your spells while levitating, and will need to stop levitating in order to fight with your claws. When levitating, your right hand is automatically equipped with the Vampiric Drain spell and cannot be changed. Your left hand is used for your blood magic spells, such as Summon Gargoyle or Raise Dead. By bringing up the in-game favorites menu, you can switch the spell in your left hand and your active vampire power. You will take damage as normal from long falls while in levitation mode. To descend to the ground and enter melee mode, press the sneak button. In this mode, you fight using your claws in a similar fashion to werewolves. You can also perform a "power bite" attack that will count toward your perk progress in the Vampire perk tree. To perform a power bite, use a power attack against a humanoid target when their health is extremely low. The power bite will not work if you do not have enough stamina to perform the attack, and it will work on any NPCs (including other vampires), but not on creatures. You can switch between modes as often as necessary while in this form. Your active vampire power can be used in either mode by pressing the shout button, though powers must be briefly recharged before they can be used again. You will have a forced third-person view while you are a Vampire Lord, and you will not be able to access character menus or maps. Opening the character menu will open the Vampire perk tree instead of your normal menus. You will not be able to pick up any items or start conversations, but you can activate switches (such as levers and pull chains) to progress through dungeons (though you will be unable to interact with objects preventing the use of switches, e.g. the bones or scraps that must be removed to use certain switches in Raldbthar Deep Market). You can use the "Revert Form" ability to return to your normal form at any time. If you have summoned a gargoyle while in Vampire Lord form, it will not disappear when you use Revert Form. Unlike regular vampire abilities, which are determined by the stage of your vampirism, Vampire Lord abilities and enhancements are level-dependent. The following abilities are granted automatically by the Vampire Lord form, along with the Bats ability, which is the same regardless of your level. Other powers and spells can be added by unlocking perks in the Vampire skill tree. ^1The range of Vampiric Drain is 10 feet. ^2When Serana is following you, the Vampiric Drain spell's damage decreases dramatically. This is a result of a condition on the Damage Health effect of the spell; if Serana is following you, the Damage Health effect will be reduced to zero points for all levels of the spell. While in Vampire Lord form, you will have access to a unique skill tree with perks that makes your special abilities more powerful. You gain progress to your next Vampire Lord perk by defeating enemies with Vampiric Drain or a "power bite" attack. The Vampiric Drain attack counts toward a perk when it kills living creatures, except rabbits and foxes, but not undead, constructs, or summoned creatures. Each new perk requires a few more feedings than the last. The first perk requires 5 feedings, the second 6, the third 9, and the fourth 10; after that, each new perk requires two more feedings than the last (up to 24 required to progress from the 10th perk to the 11th). You will need to feed a total of 156 times to complete the entire tree. Feran Sadri I find it tiring to converse with someone in that form. Too much effort. Fura Bloodmouth Parading around in that form won't do you any good here. Garan Marethi Yes, yes. Aren't you lovely looking like that. Do you mind? Hestla It's difficult to have a conversation with you like that. Would you mind changing back? Orthjolf You realize that doesn't impress anyone here. Rargal Thrallmaster Mind yourself in that form. Don't go damaging my thralls. Ronthil I hope you're not trying to lord your abilities over me. Vingalmo You realize it's not really necessary to take on that form here. There are 11 available perks, so all of the vampire perks must be unlocked for this achievement. Unarmed damage, armor, and attribute bonuses are affected by the Necromage perk. 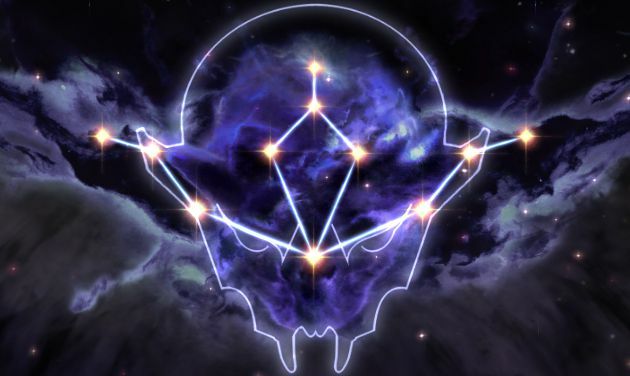 This means that at level 46, with the Power of the Grave perk, you will gain 312.5 (437.5 with the Ring of the Erudite) magicka, 375 (500 with the Ring of The Beast) health and 187.5 stamina. The Night Cloak perk heals you for the amount of damage dealt. It also stacks if there are multiple enemies surrounding you. It should be noted that the bats only appear when an enemy comes in close to you and they will disappear sometime after there is no enemy around anymore. Vampiric Grip has a very long potential range, but with no projectile to track, aiming at a distant target can be difficult. For best results, point the crosshair at a humanoid target's head, and position yourself so there are no obstacles even partially in the way. Vampiric Grip allows for easy kills against tough opponents by utilising surrounding drops and cliffs. Drawing an opponent towards you before launching them off a cliff will result in an easy kill. Your skin will become dark and cloudy if you don't feed for a while. When transforming into Vampire Lord form, first your maximum health will be increased, then you will gain the bonus from the Power of the Grave perk, then you will gain the additional attributes (based on your level). This means you will be able to heal when transforming (up to 300 health at level 46). You will not lose any Vampire Lord perks if you cure yourself of vampirism and then ask Serana to restore it. The only time you will ever face another Vampire Lord in combat is during the quest Kindred Judgement. Vampire Lords were originally developed as part of the Game Jam. They had the ability to summon imp minions. If you choose to become a vampire in the middle of being with the Dawnguard, you will have to cure yourself before being accepted back into the Dawnguard ranks. For best results when using the power bite attack, your opponent should be standing, not blocking, and you should be still and directly face your target or be directly behind your target. Your opponent can attack you and the bite will still work, and the range of the attack is unknown. At one point during development it was planned for the Vampire Lord form to last only for a limited time span, akin to werewolves. Audio with Lord Harkon advising you about this was recorded but for obvious reasons not implemented in the final release. When first changing into the Vampire Lord and entering spell mode, the Raise Dead spell that is automatically equipped to the left hand may not work on any creature or person. Equipping the spell from the Favorites menu will fix this. If you use the Revert Form power, and then use a perk before returning to non-vampire form, you will retain the Vampiric Drain spell in the right hand, which still leads to skill increase for the Vampire Lord form if used to kill enemies, but NPCs will not be hostile to you. This can be easily fixed by equipping a spell or a weapon in the right hand. Sometimes when you are made a Vampire Lord by either Harkon or Serana you will not be able to use the Vampire Lord power to turn into one. This can by fixed by typing set dlc1vampirelorddisallow to 0 in the console. The showracemenu face complexion choice applies the selected change, but the choice does not save in many cases and is reset to a default on the next load. Only the last three complexions available work for a Vampire Lord. Sometimes when changing into a Vampire Lord, you cannot switch to melee mode, use the Revert Form ability, or use any spells. Using Revert Form may cause you to lose your vampirism. When you revert back to normal form, the game will try to equip the armor and/or clothing you were wearing, but may equip similar items instead (e.g. an unimproved pair of Vampire Boots instead of your tempered, enchanted pair), and won't equip your jewelry. When using the Amulet of the Gargoyle, if the "extra" gargoyle dies before the main one, its corpse may persist for some seconds, and will be lootable. ? Sometimes while in Vampire Lord form, the game will indicate getting werewolf progress as you kill people. Sometimes the bounty from transforming into a Vampire Lord will not disappear after killing all of the nearby witnesses. The Khajiit lesser power Night Eye is removed from the Favorites list after each transformation. When Harkon gives you the vampire lord form his bite may kill you, forcing you to return to a previous save. Sometimes the roar sound from transforming into a vampire lord fails to play. When you become Vampire Lord for the first time and you have all perks enabled, you may experience that certain perks that stack points no longer function. This can be fixed by saving your game while in normal form and reloading. ? Becoming Vampire Lord or reverting form does not affect the hostility of the NPCs in Thieves Guild. Although killing undead enemies with Vampiric Drain isn't supposed to count, killing draugr, Nightingale ghosts in the thieves' guild questline, and other vampires will still advance your perk progress. While in possession of the Vampire Lord lesser power, hoods may become invisible and permanently reveal most of the player character's scalp. Loading an earlier save is the only known way to fix this. If you use conjure sword/dagger in both hands before transforming into a vampire lord, then before reverting, select a spell in the favorite menu while a vampire lord and use it before reverting, you will have the same spells you had equipped from the vampire lord form in your default form. ? The additional Gargoyle summoned by the Amulet of the Gargoyle will advance progress towards your next Vampire Lord perk if killed by the player. ?